The dog fashion and couture worlds came together yesterday in New York City for the second annual Celebrity Catwalk “Paws in the City” fashion show. Over 20 invitation-only doggy models strutted their stuff down the runway at The Cell Theatre in Chelsea — all helping to raise funds and awareness for homeless animals in the city. Former shelter pups ourselves, we are always happy to support efforts to help find forever homes for everyone! Fifteen talented pet fashion designers from around the world donated their time and talent to create beautiful designs that rocked the runway. We heard several folks say this was “the best” NYC dog fashion show they have ever seen! A HUGE paws up to the designers and Jennifer Bartok of Celebrity Catwalk for this fun labor of love. We were honored to model 7 designs! 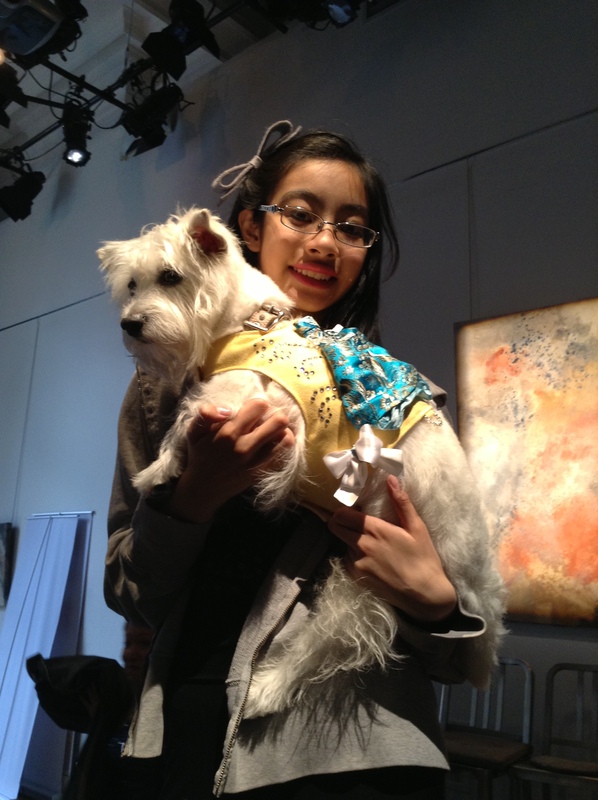 I was a bit of a runway piggy because I was trying to find my mom in the audience – BOL! (And don’t laugh at my gait — I have a luxating patella. . .) All of the pups looked smashing! The humans looked pretty good, too. A special thanks to our model, Angie, for helping me strut down the runway! Angie walked me on the runway! We took our Paws in the City designs out into the city today for a fun photo shoot. Beautiful fashions and a beautiful New York City background of Times Square and Bryant Park. We got up bright and early on Easter Sunday and headed to Fifth Avenue for the annual New York City Easter parade. Many visitors and guests were expecting an actual parade with marching bands and flowering floats. In reality, people just gather along Fifth Avenue north of 49th Street and admire beautiful Easter bonnets and colorful outfits. Some folks seem to wear updated Halloween costumes. I guess that’s one way to reuse a costume! Our friend Dawn from Bespoke Canine made bright and cheery yellow outfits for us. We had fun posing for photos and strolling along the Avenue. The weather was perfect and everyone seemed to be happy! Spring has finally arrived in the urban jungle! This year the Westminster Kennel Club Dog Show combines with the Masters Agility Championship to bring more than three thousand dogs to compete in New York City on February 8, 10 and 11. Spectators from around the world come to meet the breeds, tour the city, and party with pups when the city goes to the dogs! WELCOME TO NYC EVENT: Hosted by Puccini and Leslie Riddle, this dog-friendly Welcome to NYC event on Thursday, February 6 will raise money for the Mayor’s Alliance for NYC’s Animals. The $25 entrance fee will get you food, drinks, and lots of fun. Enjoy a fashion show and bid on great silent auction items! Held from 7 to 10 pm at Honda of Manhattan, 627 11th Avenue. NEW YORK PET FASHION SHOW: The Hotel Pennsylvania once again plays host to the New York Pet Fashion Show on Friday, February 7 from 6 to 11 pm. 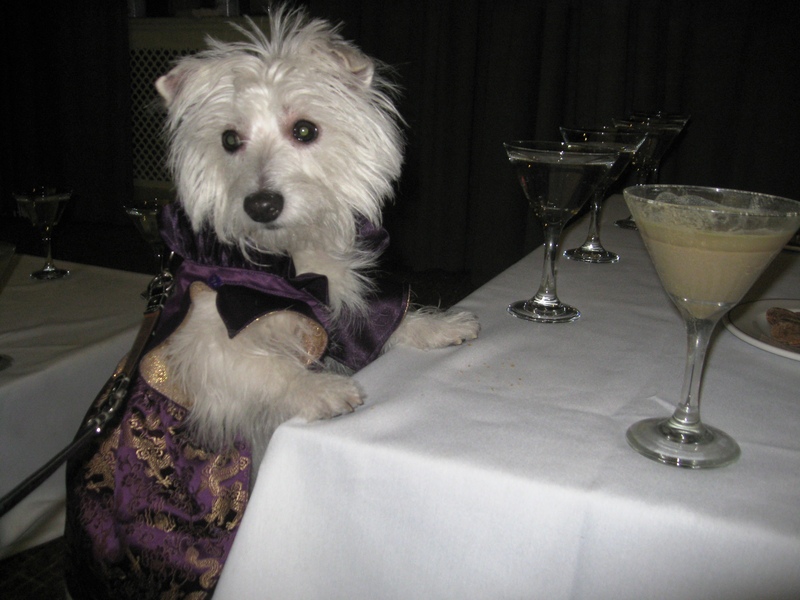 Over 1,000 people and pups will gather in the ballroom for fashion shows, vendors, hors d’oeuvres, dancing, goody bags, award ceremonies and more! Well-behaved pups are welcome to attend. Tickets are $40 in advance ($50 at the door if available) and proceeds will benefit the Mayor’s Alliance for NYC’s Animals. DOGGIES AND TIARAS: The 2nd annual Doggies and Tiaras pageant will be held on Saturday, February 8 from 2 to 6 pm at Tette Club, 154 Post Avenue. Come to see 20 canines compete in glamour, active-wear, and talent. One lucky pup will be crowned king or queen for the year! Advance tickets are $30 and proceeds benefit Inky Blue Sea Rescue. Yes, pups are welcome to attend. CELEBRITY CATWALK: Many of the events and activities during Westminster benefit animal rescues and charities. Come to Celebrity Catwalk’s brunch event on Sunday, February 9 from 11 am to 1 pm at SPOT, 145 West 20th Street. Meet other dog lovers while you enjoy tasty treats and drinks. Advance tickets are $45. Well-behaved pups are welcome to attend. THE ART: Bonhams will host their annual Barkfest charity brunch on Sunday, February 9 from 10 am to noon benefiting the AKC Humane Fund. Advance tickets are $50. Bring your pooch and come to mingle with other art and dog lovers while you view beautiful items that will be featured in The Dogs in Show & Field fine art sale on February 12. William Secord Gallery will host a reception to celebrate the opening of John Emms on Saturday, February 8 from 2 to 6 pm. THE SPECIALTY SHOWS AND AGILITY: There are several specialty dog shows that take place the weekend before Westminster. The Yorkies take over the Crowne Plaza Times Square with vendors, a dog show, and a fashion show. Many other breeds will be at the Hotel Pennsylvania and other area hotels. The Masters Agility Championship takes place Saturday, February 8 from 11 am to 10 pm at Pier 94 in New York City. THE BENCHING AREA: See the competing dogs up close and personal in the benching area behind the scenes. All Westminster Dog Show attendees are welcome to tour the area and watch grooming, dog walking, and vendors. Meet dog groomers and handlers. Arrive early because this area gets very crowded. Leave your own pup at home for this. Yorkie911 Rescue has placed over 400 doggies into loving homes over the past four years! 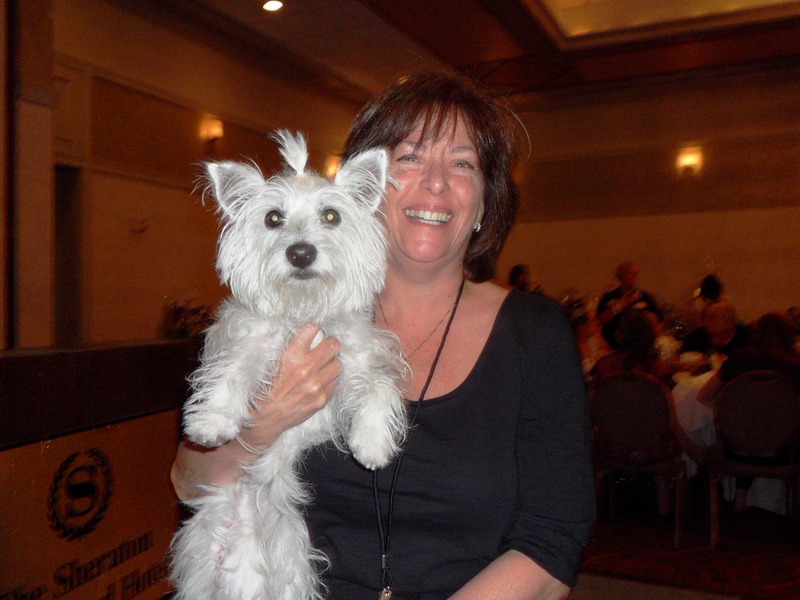 Their annual Rescues Rock the Runway event, held this past weekend at the Hauppauge Sheraton Hotel, was the pawfect place to celebrate and help raise money for even more success stories! And truth be told, the Yorkie folks sure do know how to host a great event! Food, fashion, friends, fun giveaways, and over fifty great raffle baskets! A fun day on Long Island for a great cause. Adopted dogs took center stage wearing gorgeous fashions by Toni Mari Designs, NemiCouture, Chick-a-Bow-Wow, and Vienna Couture Canine. 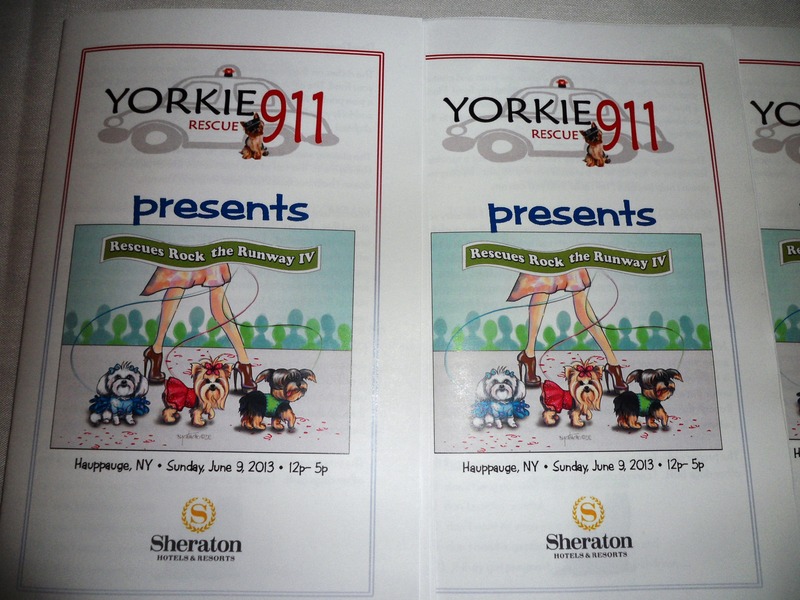 All outfits were available for sale after the runway show with a portion of the proceeds donated to Yorkie911 Rescue. We loved meeting the designers and seeing their fashions up close and personal. PawVogue came out to check out the show and take fashion photos. We had a surprise visitor- a tick! We found the critter on Ginger’s belly as we were leaving. Mom applied a vial of Frontline Plus to Ginger’s neck and the tick jumped off onto the couch where mom caught it. We called the vet who said the tick could start to spread disease only after 24 hours of attachment. He told us to apply Frontline every 3 weeks if we will visit Connecticut or Long Island, where ticks are becoming resistant sooner than the 4-week recommended dosage. Our doggy friends recommended Earth Animal Internal Powder so we will give it a try! Of course, we had just attended a Lyme disease event and mom did not take her own advice! She screamed and flushed the tick down the toilet . . . We heard it is going to be a very bad tick season in our area so we need to get prepared! We love Yorkie911 Rescue because they truly love the dogs! They are a group of volunteers with a passion for helping pups. They are always looking for volunteers to foster, visit homes of potential adopters, help at doggy adoption events, and other tasks. Join their team for the upcoming Strut Your Mutt on September 28 in NYC– an annual dog walk and fair on the Hudson River! Last night we attended a Celebrity Catwalk event featuring adoptable dogs, fashion, drama, more fashion, more drama, and fun! We’ll write full details later and also post some photos! In the meantime, check out some of the dogs on the catwalk in the video we took at the event. Furry paws hit the runway in the city!